OSLO PILOT invites you to the launch of Siri Aurdal’s sculpture Bølgelengder – rekomponert (Wavelengths – recomposed) in The Vigeland Park on Saturday August 27th at 2 pm. OSLO PILOT and Kunstnernes Hus have collaborated on a project about the work of Siri Aurdal (b. 1937), the Norwegian artist active mainly in the 1960s and 70s. The project consists of a series of both indoor and outdoor presentations of Aurdal’s sculptures and models, as well as a book produced by artist Eline Mugaas (b. 1969). The book is published by Primary Information with financially support from OSLO PILOT, Kunstnernes Hus, Norsk kulturråd and Stiftelsen Fritt Ord. The project’s basis and driving force springs from Mugaas’ longstanding efforts to archive and document Aurdal’s work, examining the potential for reactivating a past that continues to address present conditions. It also explores ideas of authorship and originality in art production. Aurdal is an innovative figure in contemporary Norwegian art history because of her experimental use of materials and monumental installations in which the audience played an active and cooperative role. An integral part of the radical artist group GRAS, Aurdal developed a material approach that combined mathematics with industrial and organic forms, and emphasized art’s social and political potential. She made the 1969 modular work Omgivelser (Surroundings) by slicing open and reconfiguring prefabricated fiberglass tubing, a material developed in anticipation of the oil industry in Norway. 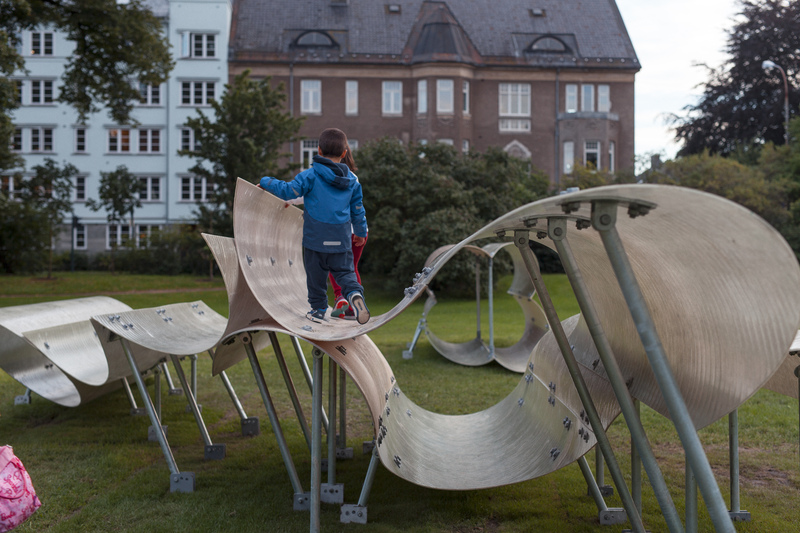 When it was first exhibited at Kunstnernes Hus in 1969, Aurdal invited visitors to climb onto it, write on it, and turn it into a social space. The modular parts used to create Bølgelengder – rekomponert (Wavelengths – recomposed) are identical to the parts that shaped the indoor sculpture Wavelengths (1969-2016), presented in the exhibition AURDAL / MUGAAS at Kunstnernes Hus during Spring 2016. This presentation is part of a wider collaborative project dedicated to showcase Siri Aurdal’s work: a solo exhibition, a publication and the outdoor installation of the sculpture Bølgelengder – rekomponert. 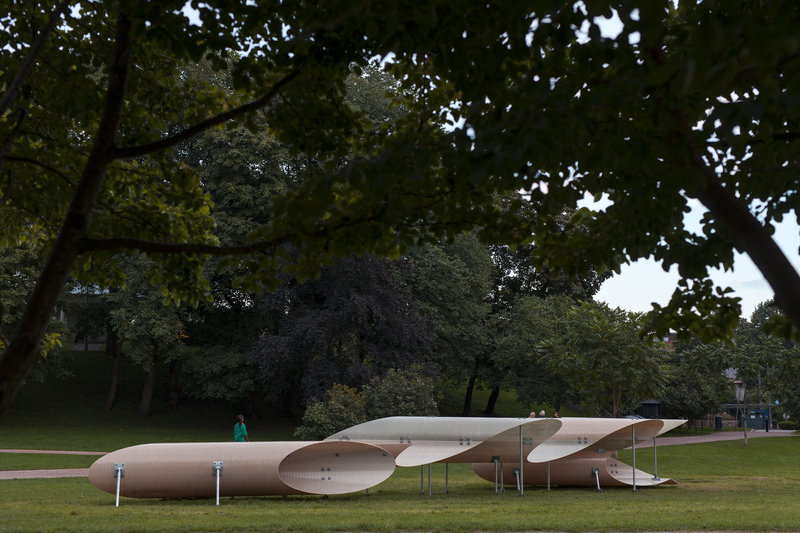 This final stage of the project hosted by The Vigeland Park, has been organised by OSLO PILOT and Kunstnernes Hus in cooperation with Vigeland Museum. 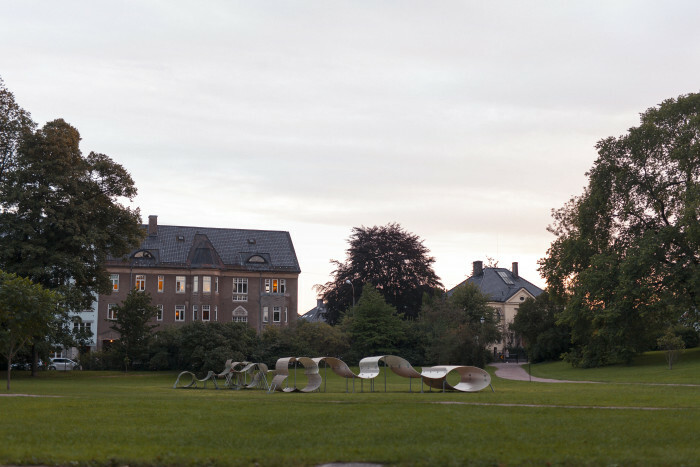 The sculpture has been produced by OSLO PILOT and Kunstnernes Hus and will remain on view to the public until November 30st.